Vembu recently released version 3.9 of their backup solution, called Vembu Backup and Disaster Recovery Suite. In addition, soon after the release, they launched version 3.9.1 which started the new era for Vembu. For the first time, they introduced Standard edition which brings new edition closer to an SMB market. The new pricing for the SMB market is hard to beat and is sure to capture the attention of SMB’s which will eventually lead to a tough competition amongst the established vendors. Take a look at this article to know more on Vembu Standard Edition. Vembu BDR Suite has been reviewed before and you read a full review here. Even though Vembu is not known on the global market as much as other vendors, they were present before in their other niche for service providers. They have the requisite knowledge and a vision with which they launched their product for the global market, aimed at protecting businesses with their Backup and Disaster Recovery Solution. There was a trend with the backup when most companies virtualized their infrastructure, there was this backup to the disk mantra. Prices of hard drives have fallen significantly. Availability of cheap NAS boxes and affordable deduplication either with the backup product or with the Windows server, enabled backup to disk to really become available to everyone. It really is very simple to deal with and restores are fast. Also having multiple locations for the backup is possible. On the other hand, all the fanfare with the crypto viruses which caused so many problems including encrypted backup repositories, companies reassessed their backup and decided that having off-line media is essential for their backup strategies. That’s why the major focus has been dedicated to tape support along with other new features that make Vembu BDR suite 3.9 and 3.9.1 so good. Native tape support – You can now create a bulletproof backup strategy. With tape as an additional type of media, you can store tapes for long-term archiving or you can use them as off-site part of the strategy. Tapes are still known to be best for long-term archiving. You can create media pools for a different type of schedules, for example, Monthly, Weekly, and Daily. Backup Encryption – to increase security even further, you can now encrypt your backups on a per job basis. Now, you can select a password when you start a new backup with the backup wizard or you can also set a password for a specific backup job. Passwords are encrypted with AES-256 bit encryption algorithm which is very secure. If you wonder how you perform a restore with encrypted backup, all you have to do is to enter a password when you start a restore job. Auto Authorization ar OffisteDR Server – with the latest version, Vembu made sure that security for the Offsite DR backup server is top notch. Currently, it may be possible that data is corrupted if the server receives data from the unknown backup server. With the latest release, Vembu’s auto authorization will create a unique passkey, which only authorized backup server can use to connect and replicate data. Pre and Post Commands – Some organizations require that special procedures are started before the backup occurs or after the backup is complete. One example is a script which creates a dump of the database and by using 7zip compresses a data to the minimum. With the latest version, Vembu has included a separate wizard which you can use to handle pre and post scripts. You can go to the Settings tab, Advanced options – Pre/Post commands. That way if you use scripts in your organizations, you can now integrate that part of the backup with Vembu as well. What about 3.9.1 and Standard version? Before Vembu 3.9.1 there were only two editions. Enterprise and Free edition. With the latest release, Vembu created Standard edition which is geared towards SMB market where the budget is scarce. Interestingly, Standard edition still supports an unlimited number of virtual VM’s and has practically no limit on the size of the clients datacenter. It also boasts features that Vembu is known for like fast VM recovery, granular recovery and Instant file recovery among others. The main limit of Standard edition is lack of some enterprise features like VM Replication, Tape backup, GFS retention, automated backup recovery, LAN Free data transfer among others. As standard edition is geared towards small business where the budget for IT is tiny, it is logical that SMB’s don’t own Tape library or off-site location for replication. More on Standard edition vs Enterprise is available on this link. 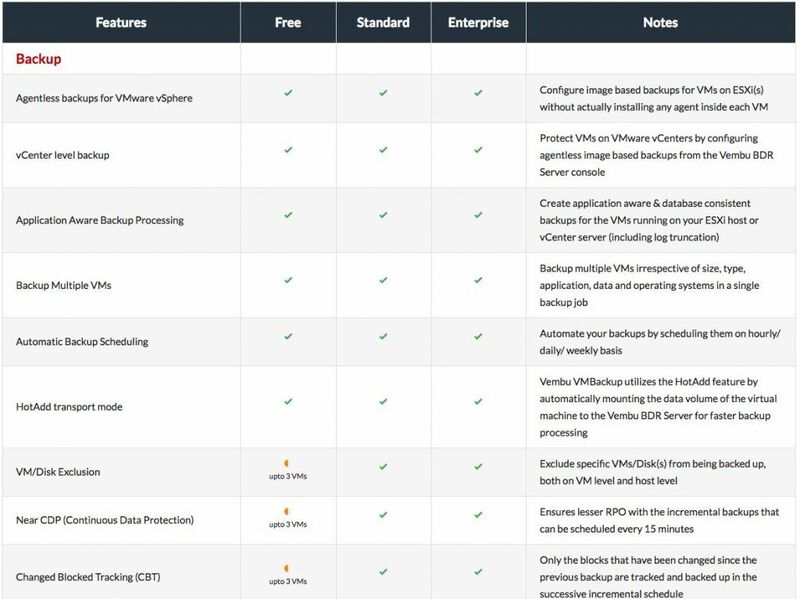 The Standard Edition for VMware Backup is priced at USD 216/CPU-socket/annum. If your requirement comes under 6 CPU sockets, you get an additional discount of 50% that could lead to USD 108/CPU-socket/annum! The Standard Edition for Hyper-V Backup also has surprises. Priced at a reasonable USD 144/CPU-socket/annum, it gets down to USD 72/CPU-socket/annum if you fall under the above-mentioned discount category. Both 3.9 and 3.9.1 made small but significant improvements to the overall product position. By adding small and regular improvements, customers don’t have to wait long for new features like it’s regular with the major releases. Also, Standard edition will make a good and reliable edition available to small business market which is usually malnourished with features.